Got Cars-mad kids? 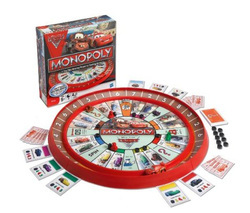 They'll love this all new Cars 2 themed Monopoly game, specially created for younger players. With the special Monopoly Cars 2 race track, no dice are required - just whizz Lightning McQueen around the track and speed your way though Japan, Italy and London. Try to stay out of jail, buy as many cars as you can, and end up as the richest player to claim top spot on the podium. This movie-themed game helps younger kids with counting, adding, and payment, plus the added attraction of all their favourite Cars characters.